AGRICULTURE is on the cusp of a revolution, with renewed enthusiasm fuelling a transformation. Precision ag, increased production capabilities, water saving innovations are all reflective of an industry brimming with opportunity. Inspired by that, one of Australia’s rural heartlands is calling forth an agricultural army – a vibrant, skilled workforce to lead into the new age. 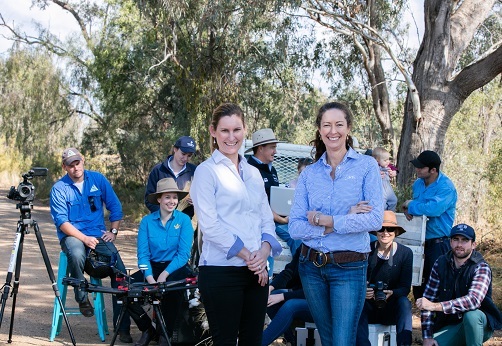 ‘Join the Ag Revolution’ is an initiative of the Gwydir Valley Irrigators Association (GVIA) in north west New South Wales, created to showcase and promote rural industries, and the passionate people behind them. GVIA executive officer, Zara Lowien, said the campaign, which launched this week via Facebook, would target social media platforms with a targeted audience of young graduates. She believed much of the advancement in the industry was thanks to the ‘can do’ attitude the industry enjoyed. “If there’s one thing rural Australia does well, it’s take initiative – we’ve developed infrastructure, designed new tools and equipment, created export markets and spearheaded water saving innovations, all thanks to our visionary Australian rural community. With the project also aimed at tapping into skilled youth, Mrs Lowien hopes it encourages job seekers to consider rural careers not traditionally associated with agriculture. In the town of Moree alone, she said the local irrigation industry had evolved to include lucrative industries such as horticulture and olives. “Here in the Gwydir we produce 32 per cent of NSW cotton crop with nearly 80 per cent of it irrigated,” Mrs Lowien said. “We also have the largest pecan orchard producing 90 per cent of Australia’s pecans and a growing citrus industry. Rabbit Hop Films director, Sascha Estens, said there was a genuine enthusiasm in the rural sector that made compelling content. “This campaign is also about selling a lifestyle, and with themes based around ‘think outside the city’, we want to celebrate all the fantastic aspects of rural life and grow our communities,” she said.